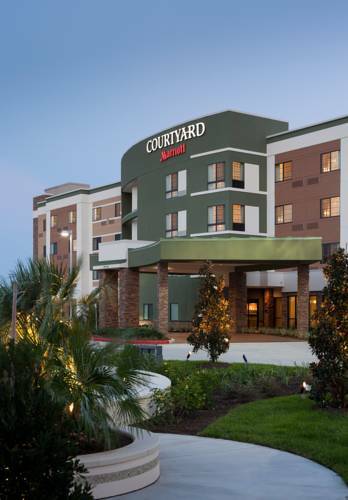 Embark on a voyage of discovery without paying out-of-this-world prices when you stay at Courtyard Houston NASA/Clear Lake. Curious travelers can learn about the intriguing science of our universe at NASA Johnson Space Center, just minutes from our hotel. Guests can also connect with nature at the beautiful town of Clear Lake, just minutes away. After an exciting day of exploring, travel back to our hotel and unwind in our spacious guest rooms. Kick back in luxurious bedding while watching TV, or stay busy with ergonomic workspaces and complimentary high-speed Wi-Fi access. When hunger strikes, head down to The Bistro, serving up breakfast, dinner, Starbucks beverages and evening cocktails daily. In your downtime, cool off from the Texas heat in our sparkling outdoor pool, or enjoy a workout in our 24-hour fitness center, boasting a variety of free weights and cardiovascular equipment with personal TV screens. Experience the wonders of science and relaxation at Courtyard Houston NASA/Clear Lake today!